In Miracle World you'll have to contend with the evil Janken the Great, who will send his henchmen and monsters at you to thwart your progress. Following the incredible success of Nintendo’s Super Mario Bros series, Sega decided that it too needed a platform game with an identifiable mascot. The result was Alex Kidd in Miracle World, which appeared in 1986 as one of the biggest releases yet seen for the company’s Master System console (known as the Mark III in Japan). Although Sonic the Hedgehog has since gone on to become the company’s primary character, many Sega fans still have a special place in their hearts for Alex, and that’s largely down to this first game in the series. At first glance Miracle World appears to be nothing more than a generic Mario rip-off, but after picking up the pad and playing for a few moments it comes abundantly clear that such a judgment is doing the game a massive disservice. Alex’s world may look similar to Mario’s, but in terms of scope it feels a lot different. The levels scroll up and down as well as left to right, and Alex has the ability to swim, too. The sense of variety is further strengthened by the inclusion of vehicles such as a speedboat, motorbike and helicopter, all of which can be purchased from shops using money that is found throughout the game. Unlike many Mario clones of the era, Sega decided not to copy the traditional ‘jump on enemy’s head’ attack technique; instead Alex punches his foes to oblivion as well as using his fists to break rocks that are scattered through each level. Alex’s offensive capabilities are further augmented by purchasing a special bracelet that allows him to fling deadly sonic waves from his fingertips. 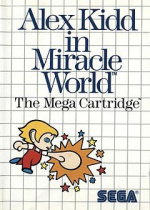 However, Miracle World is arguably most (in)famous for its boss battles, which are decided not by skill or guile, but through games of ‘Paper, Scissors, Stone’. If you win you usually have to fight the irate enemy, but if you lose you die instantly. This feature infuriated many players back in the mid ‘80s and it hasn’t lost any of its frustration today. Later in the game these boss battles become even more annoying because the player is called upon to perform incredible acts of gaming skill in order to traverse the levels, yet they find themselves undone when they reach the end thanks to these completely random games of chance. Granted, you can purchase an item that allows you to read the mind of your opponent and this obviously makes things a heck of a lot easier, but it doesn’t change the fact that Sega would have been much wiser to take the more traditional route when it comes to end of level guardians. 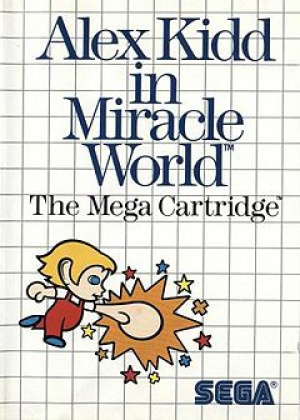 However, it’s worth noting that many people adore the ‘Janken’ games (which is what ‘Paper, Scissors, Stone’ is called in Japan) and feel that grant Miracle World a unique identity that allows it to stand out from contemporary titles. 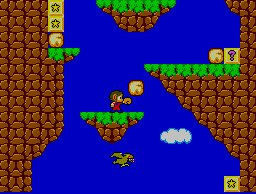 Janken issues aside, Miracle World is undoubtedly a classic in the Master System library and is easily one of the best-remembered games for the console. 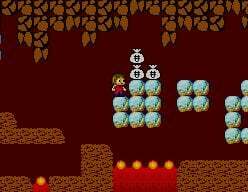 The sequels were disappointingly average; Alex Kidd And The Lost Stars changed the core gameplay completely, Alex Kidd In High Tech World was actually a retooled version of an obscure Japanese anime licence and Alex Kidd In Shinobi World was decent enough, but unsurprisingly played like a toned down version of Shinobi. 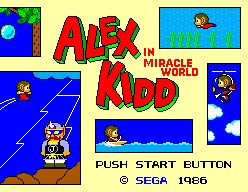 Sega did the right thing with Alex’s sole Megadrive/Genesis outing, but it didn’t really take the series any further than Miracle World had done. Therefore, Alex’s first appearance is ironically his finest hour. It’s a shame that he’s not as well regarded these days as he possibly should be, but maybe this Virtual Console release will create a few more fans. if you are a fan of platformers, you'll love this game. Can't believe this game only got a 7 its easily an equal to Super Mario Bros. Should have been given a 9.